Classic QRH contains latest factory procedures but with an easy to use "arrow" format instead of changing pages to follow step numbers. Covers 300, 400, and 500. 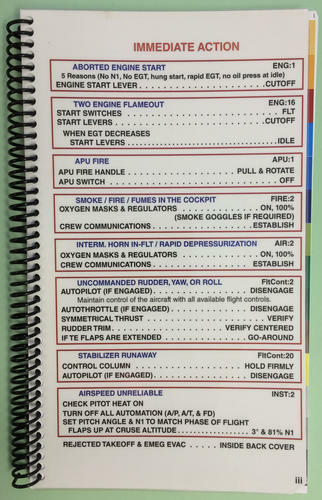 Written as a training and study tool. Printed on 32# paper. Coil bound. Not to be used in the actual airplane - you must use your company issued QRH. Sample performance charts do not match any particular 737.